The following steps show how a device with an externally-configured address uses DHCP to get other parameters (see Figure 266 as well). A device that already has an IP address can use the simple request/reply exchange shown above to get other configuration parameters from a DHCP server. In this case I have shown the client broadcasting its request. The client (which again, may be a DHCP server acting as a client) creates a DHCPINFORM message. It fills in its own IP address in the CIAddr field, since that IP address is current and valid. It may request specific parameters using the Parameter Request List option, or simply accept the defaults provided by the server. The client sends the DHCPINFORM message unicast, if it knows the identity and address of a DHCP server, otherwise, it broadcasts it. The message is received and processed by the DHCP server or servers (if there are multiple and the request was broadcast). Each server checks to see if it has the parameters needed by the client in its database. The server sends the message unicast back to the client. 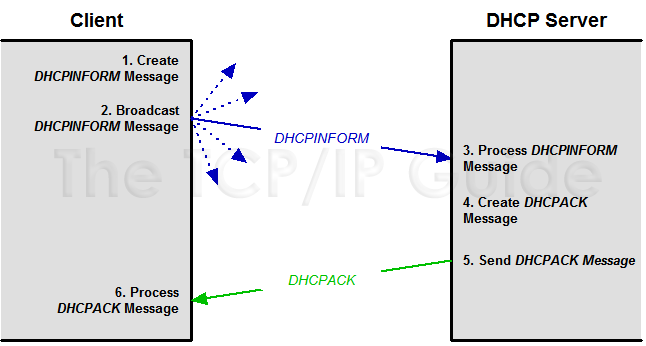 The client receives the DHCPACK message sent by the server, processes it, and sets its parameters accordingly. If a client receives no reply to its DHCPINFORM message it will retransmit it periodically. After a retry period it will give up and use default configuration values. It will also typically generate an error report to inform an administrator or user of the problem. Key Concept: Devices that are not using DHCP to acquire IP addresses can still utilize its other configuration capabilities. A client can broadcast a DHCPINFORM message to request that any available server send it parameters for how the network is to be used. DHCP servers respond with the requested parameters and/or default parameters, carried in DHCP options of a DHCPACK message.